"The chapters are carefully written by well-recognized leaders in the field; each reflects strong scholarship and conceptual richness." "…anyone interested in knowing more about the non-biological approaches to biological illness would do well to at least `give it a browse'." Contents: P.M. McCabe, N. Schneiderman, R.W. Winters, C.G. Gentile, A.H. Teich, Learned Aspects of Cardiovascular Regulation. M.E. Stanton, S. Levine, Pavlovian Conditioning of Endocrine Responses. 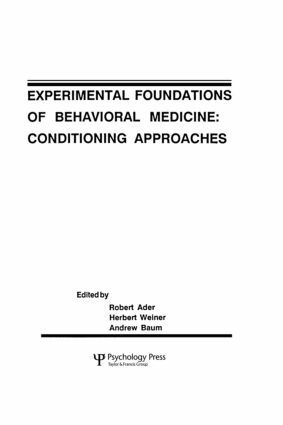 R. Ader, The Placebo Effect as a Conditioned Response. B. Dworkin, S. Dworkin, The Treatment of Scoliosis by Continuous Automated Postural Feedback. W.S. Agras, Relaxation Training in Essential Hypertension: Prospects and Problems. T.L. Creer, The Synthesis of Medical and Behavioral Sciences with Respect to Bronchial Asthma. R.S. Surwit, Stress, Behavior and Glucose Control in Diabetes Mellitus. H. Weiner, A Proposal for a Curriculum in Behavioral Biology and Medicine in Medical Schools. H.B. Curry, Training of Family Physicians in Behavioral Medicine. A.P. Shapiro, Teaching Behavioral Concepts in Cardiovascular Disease with Remarks on Challenges to Medical Education.